The best kind of physics is the new kind. How do you find new physics? By using physics of course! use physics to find more physics! The purpose of particle colliders like the Super Proton Synchrotron (SPS), the Large Electron-Positron collider (LEP), the Tevatron, or the Large Hadron Collider (LHC) is to test physical theories in order to ultimately figure out what works and doesn’t work. Sometimes all the time we get disappointing results (technicolor, extra dimensions, additional vector bosons), and sometimes rarely we score big (top quark, Higgs boson). It’s all a part of the business. The utility of colliders is that, with them, there are multiple ways hypotheses can be tested. One particularly powerful method to test models like the Standard Model of Particle Physics (SM) is to look for processes that are both (a) relatively rare and (b) relatively unique. For example: in the theory that governs how light and matter interact, also known as Quantum Electrodynamics (QED), we can take an electron (e-) and its antiparticle, a positron, (e+), and use them to produce two photons, the particles of light (γ). Figure 1 below shows how this can happen diagrammatically. In short, either the electron or the positron first radiate a photon (γ), and then the electron and positron annihilate forming the second photon (γ). Figure 1. A Feynman diagram representing the production of two photons from electron (e-) and positron (e+) annihilation. In the 1990s, back when the Large Hadron Collider (LHC) was just a dream on paper, another accelerator called the Large Electron-Positron collider (LEP) existed in the same tunnel the LHC currently occupies. The goal of LEP was to study the very fine details (“precision work”) of the theory we now call the Standard Model of Particle Physics (SM). At the time, this was particularly concerning because the W and Z bosons had only been discovered ten years prior at the Super Proton Synchrotron collider (SPS), and establishing the SM hinged on knowing their properties. LEP, along with the Tevatron, did just this. In fact, some of the most precisely measured results of the SM bosons still come from LEP. At LEP, physicists decided to pursue an idea that made many of the same people who discovered the W and Z bosons pause for just a moment. LEP experimentalists set out to produce two W bosons and two Z bosons at the same time. Just like the diagram for producing two photons in QED (Fig. 1), there is diagram depicting how two W bosons can be produced from an electron (e-) and positron (e+). See Figure 2 below. The diagram for producing two Z bosons is identical to Fig. 1, just replace “γ” with “Z“. In the case of W+W- production, either an electron or a positron first radiates a W boson; an e- will radiate a negatively charged W boson, W-, and an e+ will radiate an positively charge W boson, W+. After radiating the boson, the electron (or positron!) is converted into a neutrino (or anti-neutrino! ), and annihilates with the positron (or electron!) to produce the second W boson. Figure 2: A Feynman digram representing how the neutrino contributes to W+W- pair production from electron (e-) and positron (e+) annihilation. However, unlike producing two photons, there is another process that can contribute to producing two W bosons. Figure 3 below shows that an electron (e-) and positron (e+) can also annihilate into a photon (or a Z boson), and then the photon (or Z boson) can split into a W+ and W- boson. Figure 3: A Feynman digram representing how the photon and Z boson contribute to W+W- pair production from electron (e-) and positron (e+) annihilation. In the 2000s, physicists at the Tevatron took this a step further. It starts by recognizing that since electrons and positrons can produce two W bosons, and since physics going forward in time behaves identical to physics operating backward in time (time-reversal symmetry), then two W bosons can be used to produce an electron and positron. Figure 4 below shows how this can happen diagrammatically. Figure 4: A Feynman diagram representing how to produce an electron (e-) and positron (e+) pair from a W+ and W- boson pair. Here is physicists got clever. The diagram in Figure 3 and the left diagram in Figure 4 have the same intermediate particle: a photon or Z boson. The rules of quantum field theory allow us to then take the second half of Fig. 3 and the first half of the left diagram in Fig. 4, and attach them! As a result, two bosons can be used to produce two more bosons! A few examples: a W+ boson and a W- boson can annihilate or exchange a photon (or Z boson) and produce another two W bosons (Figure 5 below); two W bosons can also go in and produce two photons, two Z bosons, or a photon and Z boson; in fact, two photons can go in and even produce two W bosons! This sort of phenomena is generically called “Weak Boson Scattering,” “Vector Boson Scattering,” or “Vector Boson Fusion,” and in 2006, the Tevatron‘s DZero detector experiment provided the proof of this process when it measured the rate of two Z bosons being produced simultaneously (press release). Figure 5: A Feynman diagram representing how the photon and Z boson contribute to W+W- scattering. Warning: Technical Detail. Abandon hope all ye who… I mean, Weak Boson Scattering at the Tevatron differs from producing two bosons at LEP in a subtle way. At LEP, both the electron (e-) and positron (e+) ultimately annihilated and ceased to exist. At the Tevatron, each initial W and Z boson came from a quark (or antiquark) that radiated the boson but did not ultimately annihilate (Figure 6 below.). The analogous process that occurred at LEP did occur at the Tevatron (and vice versa), but the two processes can be to some extent distinguished from each other. 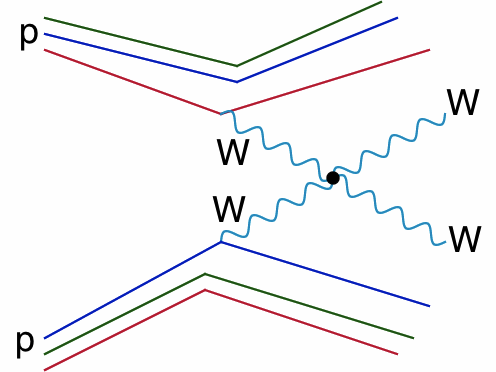 Figure 6: Diagram depicting the process known as WW Scattering, where two quarks from two protons each radiate a W boson that then elastically interact with one another. However, we have to be careful here. Much like how we needed to include an additional diagram when progressing from producing two photons to W+W- production with electrons and positrons, we need to include additional diagrams for W+W- production when starting with two W bosons. A hugely important process that warranted the Higgs boson’s existence long before it was found is when we replace the intermediate photon and Z in Fig. 5 (above) with a Higgs boson. See Figure 7 below. By measuring the rate of weak boson scattering, one can in principle infer the mass of the Higgs boson. This is precisely how physicists at the Tevatron and the LHC were able to rule out the existence of a very massive Higgs boson. Figure 7: A Feynman diagram representing how the Higgs boson contributes to W+W- scattering. In fewer than 30 years, physicists have gone from discovering the W and Z bosons (SPS), to producing two of them simultaneously (LEP), to creating a proof-of-principle vector boson collider (Tevatron), to using a new vector boson collider as a probe for new physics (LHC)! We have already discovered the Higgs boson using this method and we are definitely hoping to find something more. If there are more vector bosons in the universe, then it is certainly possible that they may contribute to vector boson scattering by replacing any of the lines in Fig. 5; see Figure 8 below. Figure 8: A Feynman diagram representing how a new vector boson (?) can contribute to W+W- scattering. It is also certainly possible that there are additional Higgs bosons. Those can contribute to vector boson scattering by replacing the Higgs boson in Fig. 7; see Figure 9 below. Figure 9: A Feynman diagram representing how a new scalar (?) can contribute to W+W- scattering. This is how research in high energy physics progresses: discover something new, turning it around, and throwing it back at itself. You can be certain that there is already research into scattering Higgs bosons and how this next iteration of collisions could be excellent tests of theories like technicolor, extra dimensions, or the existence of additional vector bosons. Until next time!